If you follow me on Instagram, you probably already know that I am a confessed magazine junkie! I usually post the grocery store shot photo of the newest magazine that just happened to land in my cart! 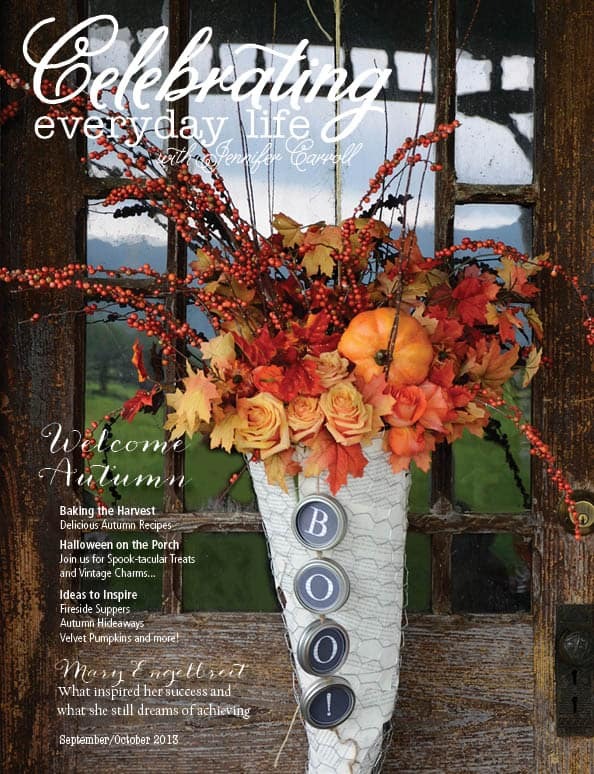 So needless to say, I was over the moon when asked to preview and review the latest issue of Celebrating Everyday Life full of beautiful photos and wonderfully written articles on fall home decor, recipes and crafts. If the beautifully vibrant fall cover doesn't make you excited to read further, I don't know what will! Click for your FREE PREVIEW!! You will find creative and fun crafts to try! Beautiful fall photos! Isn't this just gorgeous! It makes want to take a blanket and curl up inside for a nice nap. I don't think my host could ever get me to leave this Fireside Supper! Elegantly spooky Halloween vignettes are here to inspire. Lovely inspiration for the fall collected home. Jennifer Carrol has really outdone herself with this issue. The group of contributors are sure to inspire the fall season in your home so that you can celebrate everyday life! Just visit Celebrating Everyday Life for information on pricing and the 3 ways to view. I hope you have a fall filled weekend! I was given a free copy of this magazine for review. All opinions are my own! I love magazines too, but I don’t think I have ever seen this magazine. But now I will be looking for it. Thanks for sharing. It is beautiful! I think this is an online order magazine. The digital versions that you can read on your computer or IPad are the most economical! Have a lovely weekend and happy fall!!! Never heard of this magazine; will look for it in grocery store or drug store today. Thanks for sharing. Is that Jennifer Carroll one of our bloggers? Her picture looks so familiar. It is beautiful! Yes, Jennifer is a blogger. I think this is an online order magazine. The digital versions that you can read on your computer or IPad are the most economical! Have a lovely weekend, sweet Mrs. Betty!